← Breaking NEWs in RAdio- Exceptions To The Rules Radio Show May Be On The Rise – These Communities Need it for sure. Posted on January 21, 2015 | Comments Off on My Hope & Marcy- Short Inspirational Story by: E. Michelle Lee , radio talk show host. Have you ever thought about what you would do if all of a sudden a major life emergency happened to you? Are you prepared? 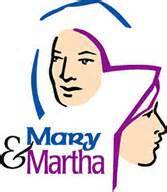 Do you have a Martha & Mary – Hope & Marcy..? Her left leg and hip had been hurting for many months. Nothing totally took away the pain; but she kept on going. Monday’s water workout seemed to take the edge off of the pain a bit, but then by Tuesday morning, she was paying for it with double the pain than the day before. Wednesday came and she had no choice but to go and see if she could try once again to push through the pain and get relief. It usually worked for her; but would it this time? By the end of the hour-long class, Chelle couldn’t even get out of the pool by herself. The intensity of the pain was at the point of tears by now. Then came along Hope and Marcy, two students in her class. Hope on one side and Marcy on the other; one under each arm. After a few minutes when all the women left to hit the showers, Chelle cried out, help me! Back again-Hope and Marcy by her side. Hope took her van keys and brought it around to the front of the building while Marcy lead her out through the gym. Soon as the door opened the wind chill factor of 16 below hit the hip and legs and instantly froze in place. Nearly having to crawl the rest of the way the tears and screams of agony just made your heart ache for her pain. After getting her into the van; she tried to raise the seat with the lever on the side of the passenger seat. Unfortunately, the handle swung the other way and dropped her backwards. To the top of her lungs, a screeching scream came out with a big ol- Jesus! Dear God, did she just break? It sure sounded like she was done. After Hope & Marcy got her through the door and seated inside her house; her son found her in that same spot a little more than four hours later. The surprising and inspirational act of kindness came when over the course of the next two weeks Marcy remained full of compassion and happy to serve. Beautiful story of the way we should take care of each other. Marcy showed Chelle the compassion she needed to feel so she could once again feel that tender heartedness she once knew. An act of kindness by a stranger restored love and hope that only could be felt when you have someone to count on in time of need. Keep believing there are still good people on this earth who care. We just have to connect with them. This entry was posted in Fibromyalgia Chronic Pain, Inspiration, Motivation, Prayer and tagged Are You Prepared for life emergiences?, Compassion, Friends, Hope, Marcy, Motivation, My Hope & Marcy by E Michelle Lee, PAIN, Radio Talk Show Host. Bookmark the permalink.